Disclosure: I was sent a screener from the vendor in order to write up an honest review. However, all views shared are mine and mine alone. New from Sony Pictures Home Entertainment, on 4K/3D Blu-ray and Blu-ray Clay Kaytis' The Angry Birds Movie (2016), featuring the voices of Hannibal Buress, Peter Dinklage, Bill Hader, Josh Gad, and Danielle Brooks. This new Blu-ray and DVD release is now available for purchase, as of August 16. 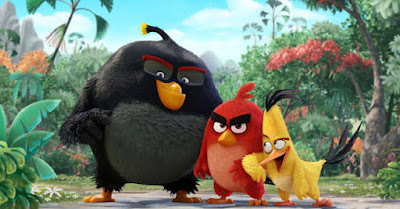 "In the 3D animated comedy, The Angry Birds Movie, we'll finally find out why the birds are so angry. The movie takes us to an island populated entirely by happy, flightless birds – or almost entirely. In this paradise, Red (Jason Sudeikis, We're the Millers, Horrible Bosses), a bird with a temper problem, speedy Chuck (Josh Gad in his first animated role since Frozen), and the volatile Bomb (Danny McBride, This is the End, Eastbound and Down) have always been outsiders. But when the island is visited by mysterious green piggies, it's up to these unlikely outcasts to figure out what the pigs are up to. Featuring a hilarious, all-star voice cast that includes Bill Hader (Trainwreck, Inside Out), Maya Rudolph (Bridesmaids, Sisters), and Peter Dinklage (Game of Thrones), as well as Kate McKinnon (Saturday Night Live, Ghostbusters), Keegan-Michael Key (Key & Peele), Tony Hale (Veep, Arrested Development), Tituss Burgess (Unbreakable Kimmy Schmidt), Ike Barinholtz (Neighbors, Sisters), Hannibal Buress (Daddy's Home, Broad City), Jillian Bell (22 Jump Street), Danielle Brooks (Orange is the New Black), Latin music sensation Romeo Santos, YouTube stars Smosh (Ian Hecox and Anthony Padilla), and country music superstar Blake Shelton, who writes and performs the original song "Friends," the Columbia Pictures/Rovio Entertainment film is directed by Fergal Reilly and Clay Kaytis and produced by John Cohen and Catherine Winder. The screenplay is by Jon Vitti, and the film is executive produced by Mikael Hed and David Maisel." The other day we had a movie night with the girls to watch The Angry Birds movie, which recently released to Blu-ray. If it wasn't for the toys Bella had asked Santa for last Christmas, I don't think I would have ever known about the Angry Birds craze. Since that time, the girls can't get enough of these crazy birds. They can spend hours playing video games on our phones or tablets, watching Angry Birds toons, or simply pulling out all their different Angry Birds toys and building sets and getting lost in the fun of these wacky birds. My girls were quick to school my husband and I on the birds and what was in store for us, thanks to their frieds telling them about the movie which was in theaters earlier this summer, as well as all the trailers and clips they have seen on television and while using the iPad. I have to say that while I am not a fan of Angry Birds like my girls are, I did enjoy this movie, as did my husband. We both loved thr cute puns and jokes that were made throughout the movie, that are girls were too young to understand. They did, however, laugh throughout the film as the birds, who flock together, worked together to keep the pigs from stealing their eggs. While some may not consider this a family friendly film, if you have a background knowledge on the franchise and know of the puns and innuendos that the films shares, you can make a judgement call on who you will allow to see the film. Even though my girls are young, I knew they would be watching the film from the standpoint of fans of the franchise as they love the birds and the silliness they represent. I was not expecting them to pick up on the jokes and at times crude humor that this film shares. 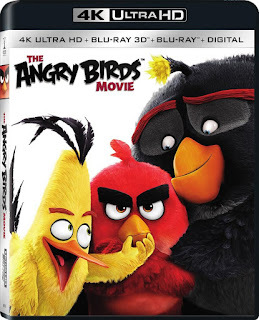 We found ourselves all laughing at different parts of the movie, and had fun watching this action packed film, that is a must see for Angry Birds fans. We still have not yet seen this movie but it look cute.